IDF Northern Command demands UNIFIL act to dismantle Hezbollah tunnels on Lebanese side of the border. The commander of the Northern Command, Maj. Gen. Yoel Strick, held a meeting with UNIFIL commander General Stefano del Col Thursday. 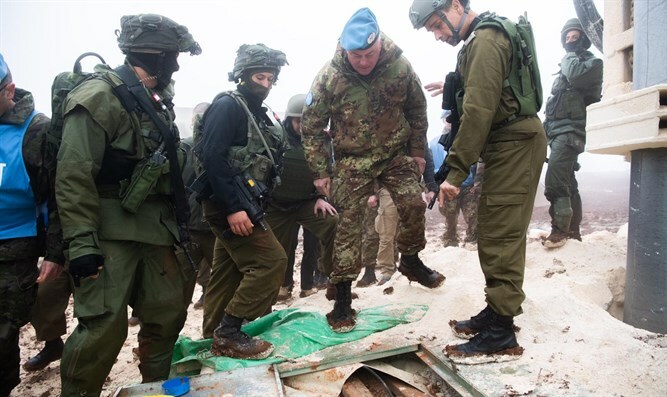 During the meeting, Gen. Col took a tour of the terror terror tunnel dug by the Hezbollah terror organization from Kafir Kila in Lebanon into Israeli territory. The commander of the Northern Command, on behalf of the IDF, expressed his strong protest against the violation of Israeli sovereignty by the Hezbollah terror organization with the aim of harming Israeli civilians, adding that this was yet another proof of the serious violations of the Hezbollah terrorist organization. The Lebanese government is responsible for the tunnels being dug by Hezbollah in southern Lebanon, he stated. Ma. Gen. Strick told Gen. Col of the assistance Hezbollah received from a nearby Shi’ite village, where a group of houses were used as the entrance point for a another terror tunnel that violated Israeli territory. He demanded that UNIFIL ensure the neutralization of the tunnel on the Lebanese side of the border as it represents a mortal danger to the residents of nearby Israeli towns. The IDF stated that it views the Lebanese government, the Lebanese army and UNIFIL as responsible for all that is happening in Lebanon and for enforcing UN Security Council Resolution 1701.